When I first started shooting outdoor I shot regular plastic vanes. Once I did some research and found out about the benefits of Kurly Vanes, we did a test with them versus my old ones. In continuous wind, the Kurly Vanes definitely shot better. I have been using them since with okay results and I do think in the gusty wind in Arizona would have been much harder on me if I had still had my old vanes. When I went to Texas Cup though, the wind was gusting on and off, completely picking up my arrows with them. It was crazy! In Arizona, AAE was the tournament sponsor and we got sample packs in our bags of their new Wav vanes. We decided when I went to Texas in practice, we would try them against the Kurly Vanes to see how they worked out. I tried them on 60m in the crazy wind and they flew completely straight in a much tighter group! When I shot the same number at the same distance of the Kurly Vanes they went horizontally before hitting the target and the arrows were very far from each other. 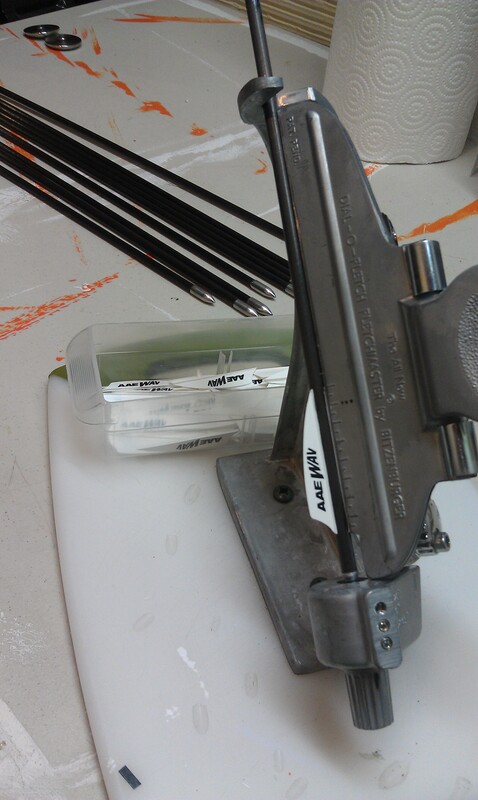 Once we got back, we decided to use the AAE Wav vanes for Gator Cup. I will let you know what I think when I get back! When we travel to tournaments we always look at what the top archer’s equipment choices are. If there is something Emma and I see interesting we take pictures and then do our research when we get back home. We saw that Brady Ellison was using AAE Wave vanes at Arizona Cup we were excited to get a sample in our welcome bag. Emma was using Kurly Vanes at Arizona Cup and we were watching her arrows almost go completely sideways in flight to the target at 60 meters. I walked down to watch Mr. Ellison and his arrows had a much better flight in the same conditions. This made me decide to try the AAE vanes. I fletched 3 arrows with the AAE Waves and we took then to Texas Shootout. I had Emma shoot 3 Kurly Vanes and then the 3 AAE vanes. The AAE vanes consistently flew better in the high wind conditions there. Emma is now shooting the AAE Wave vanes and she has seen her grouping tighten and we are very satisfied with their performance.